Those of you who follow me know I have a Chihuahua named Carmelita or Lita for short. She's large for a Chihuahua but still a small dog and this snowy weather is just too much for her! 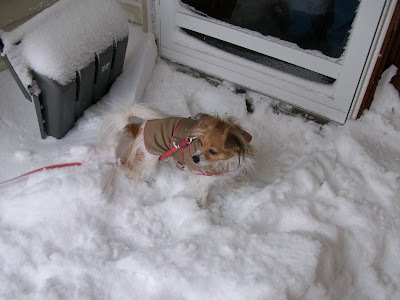 The snow is too high to walk through and the freezing cold has been keeping her inside more days than she likes. When she can get out we only make it down the street and she has to be carried home and then warmed up with a blanket from the dryer. This winter is the worst she's known so far and she lets me know about it everyday! Poor little Lita! My little ones hate this weather too. I have to chase a couple of them around the house and pick them up and set them down outside or else they won't go. Luckily I didn't have to shovel a path in the backyard because Blue created a huge maze as he walks around the yard! It's very cute, watching him walk around with all the little ones tiptoeing behind him! I totally understand. We have 4 Yorkies. We shovel shy of half the yard for them. They don't like it when it snows again and covers up their yard! One more reason I love the south in the winter. I'll pay for it this summer though. My Shih tzu doesn't like the heat. What I'm Doing On A Saturday Night. What Going On In Sassyland?